CLICK here to VIEW PHOTOS FROM this years Annual Gala + Silent Auction at Hotel ZAZA!!!! 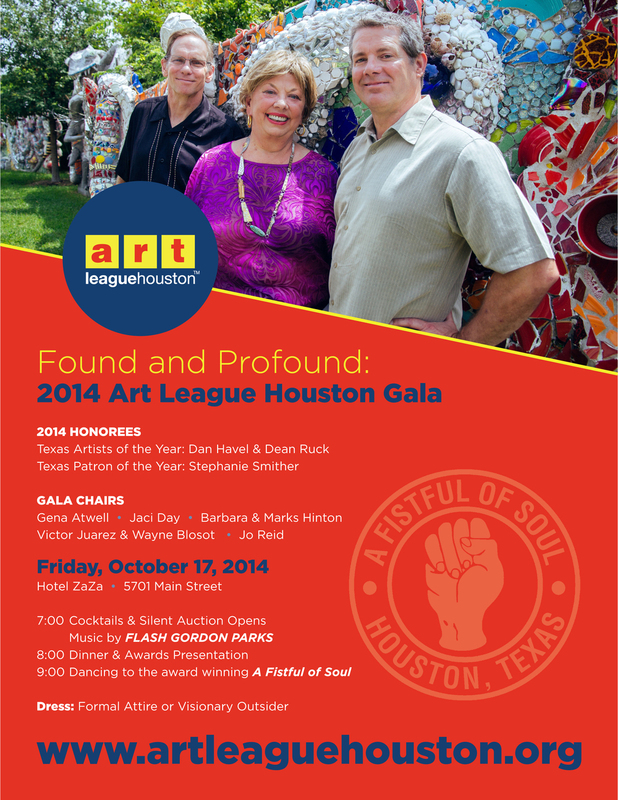 As 2014 Texas Artists of the Year, Havel Ruck Projects will be featured in a six week exhibition in the Art League Houston Main Gallery, opening on September 19 - November 1, 2014. At the same time, Art League Houston will present an exhibition of Texas folk and visionary artwork from the collection of Stephanie Smither in the ALH Front Gallery. All three awardees will be celebrated at the annual gala, which will be held in their honor on Friday, October 17 at the Hotel ZaZa. A portion of the evening’s proceeds will go to Smither Park, a project of The Orange Show Center for Visionary Art, in honor of Stephanie.